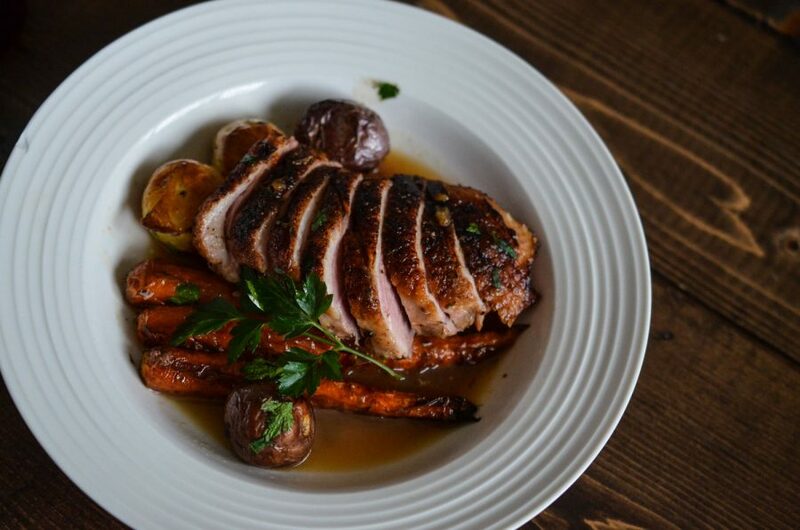 Duck is so versatile in its flavour – working with anything from savory to sweet. Here, we’ve gone for a mix of both. A hint of sweetness from the fig, with some complimentary baking spice flavours from the Big Rock Winter Spice, and the notes of savory from the chicken stock, thyme and lemon. An easy and delicious sauce – one sure to make you look like a rock star (and feel fancy doing it too!) without too much fuss. Tip: I love duck, but I’m always so nervous to make it. The real trick is to not over cook it! I don’t know about you, but I live by my thermometer. So when making this make sure you don’t cook above 135F if you want it medium rare! Season the duck breasts with the onion powder, paprika, salt and pepper. Cut 3 slits in the fat-side of each of the duck breasts and place fat-side-down in a large cast iron skillet over medium heat. Sear fat side down for 10 mins, or until most of the fat has rendered. If it starts to become too brown, reduce the heat. Once the duck is seared, flip to the crispy, fat-side up. Place the pan in the oven and cook for about 10 mins. Meanwhile, heat the chicken stock and beer in a large saucepan over medium heat. Reduce until about ¼ of the volume, approximately 10-15 mins. When reduced, whisk in the fig jam until smooth, trying to prevent any clumps. Add the time, onion powder, lemon juice, salt and pepper. Whisk together thoroughly until fully incorporated. Once the internal temperature of the duck reaches 135F, remove from the oven and set aside to rest for 5 mins before serving. Right before serving, remove the sauce from the heat and whisk in the butter. Whisk quickly to ensure the butter melts quickly but does not settle. This will create a creamy sauce that will be delicious with your duck. Serve with mashed potatoes or roasted vegetables.